The philosophy of craft cider: a conversation with Coffin Ridge’s Joel Loughead | Rrampt. Joel Loughead strolls out to greet me wearing big rubber boots and a beaming smile. He’s carrying two cans of his Hopped Cider, the second ‘child’ in his Forbidden Family. It’s a Family he’s been raising at the Coffin Ridge winery for a few years now, and the resemblance between each sibling is their “clean, crisp qualities and a tart, bright edge,” he explains. It’s clear that Loughead loves talking about his Family. And after a brief exchange about what landed him as the cider maker at Coffin Ridge, it’s also clear he’s not your average cider maker. I agree. It’s easily one of the best. And while we’re on the topic of best’s, their restroom is right up there too. When I came out for a glass of the Maple Rosemary small batch a few weeks ago, I was tempted to spend a few hours watching Ghostbusters in the spacious lavatory until I remembered that my girlfriend was waiting for me outside. 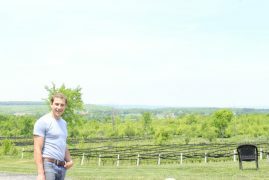 It’s no longer a secret that this region is producing great wine – according to Wine Country Ontario, the Georgian Bay area is now considered an emerging region in the wine industry and Coffin Ridge was the first to plant vines in 2001. They’ve since expanded from 5 acres to 25. And others have followed suit. But we’re not here to talk about wine. We’re here to talk about cider. It’s a good problem to have and one he believes is being driven by Millenials (who apparently haven’t ruined everything after all). He believes they’re the reason behind the surging craft beer and cider trend in North America. “Even though we’re the most impoverished generation, we’re also willing to pay top dollar for good things – for local, handmade things,” he argues. But Loughead never set out to become a cider producer. He doesn’t even have a formal education in the industry. 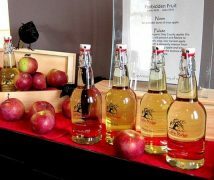 He has a degree in philosophy and English Lit, but through his love for cider, lots of research, and a few years of experience, he’s worked hard to become the leading cider maker in this area. As someone with an English degree myself, I can relate to the struggles of finding your way in a world that devalues a Liberal Arts education, but he tells me there are actually many winemakers in the world with such degrees. “There’s a long history of philosophy and philosophizing throughout the history of wine making going back to the Symposium, which literally means ‘to get drunk together and think about things,” he says. Sounds like a lot like my twenties – I would’ve fit right in at the Symposiums. Our lunch hour was winding down, and it came time for my final question: the culmination of the two major elements of Joel Loughead. I had to know what his philosophy of cider making was. Was he a rationalist or an empiricist? Did he borrow from the Kantian school, or possibly apply Plato’s theory of forms to the essence of the apple? Aha! I sense a bit of Hegel’s Dialectics in there! Wine is the thesis; beer is the antithesis; and Georgian Bay cider is the synthesis. Or maybe I’m full of crap, because I only took one or two philosophy courses in school. And with that being said, we both realize we’ve finished off a can of the Forbidden Hopped and we both have work to get done. I could have sat there looking over Georgian Bay for the whole afternoon on one of the best patios in the province. Instead, I decided to use one of the finest restrooms in the province before heading out, and maybe catch the last half of Ghostbusters playing on the big screen.